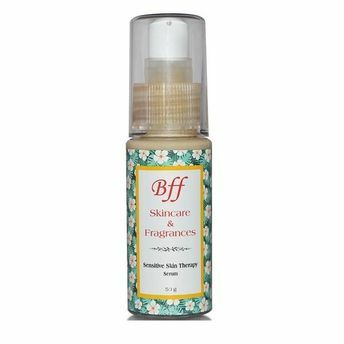 BFF Skin Care's Sensitive Skin Treatment Serum is an all-in-one anti-microbial, anti-inflammatory, nourishing & repair treatment; formulated using natural ingredients. This dermatologist approved and tested serum is rich in Acai Berry & Apricot kernel oil. This moisturizing serum lessens the irritation, which can be caused by several reasons, from facial, sunburn, to windburn, waxing and overuse of cosmetics. When applied on daily basis, this serum hydrates the skin, and provide required elasticity to dry and irritated skin. Acai Berry: Known for most for the highest level of antioxidant fruit in the world. It helps combat the free radicals and promotes a healthy skin for a beautiful glow. Induces collagen production & increases elasticity. It also reduces inflammation & induces Cellular Regeneration. It has rich concentration of healthy Omega fatty acids and has a potent form of Vitamins (C, A & E). Apricot Kernel Oil: Light and gentle on the skin, known for its emollient, anti-Inflammatory & antioxidant properties.